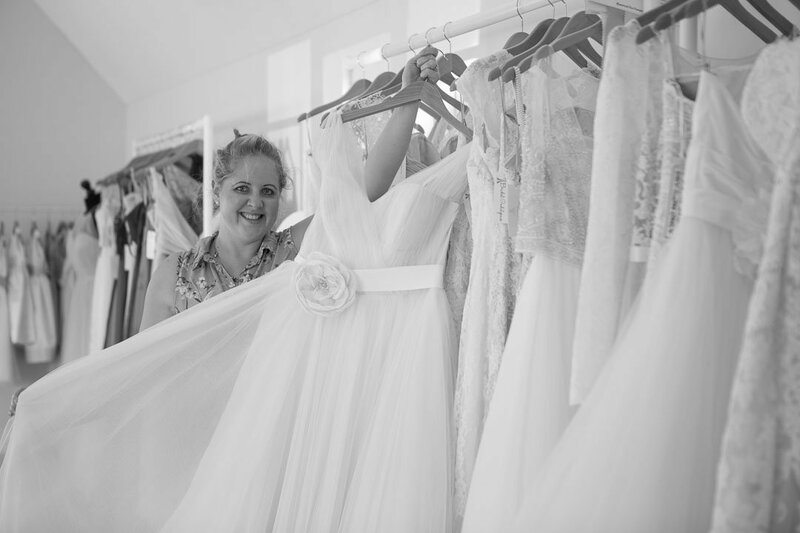 For the next in my Wedding Inspiration blogs I caught up with Kerri Ashworth of Bridal Indulgence, based in Crondall, near Farnham. Kerri ‘s dream of opening a wedding dress shop came to fruition when, on her thirtieth birthday, she handed in her notice to work so she could launch Bridal Indulgence. The showroom is in a converted barn, tucked away in the countryside. ME: When should a bride first start looking for her dress? KA: She should start a year before (or more), the minimum would be six months from ordering date to the wedding date. During that time she will have two or three fittings. I have two dedicated seamstresses who do this. ME: When brides come to you do they have very set ideas on what they want? KA: For the first appointment I encourage brides to come with an open mind – try on everything. You might end up buying a dress that you hadn’t even considered. You can only really see what suits when you try it on. ME: How many people should she bring? Or should she come on her own? KA: I think that two friends is a good number, she doesn’t want to be overwhelmed by opinions. ME: What is popular at the moment? KA: Full length. With either a full skirt or very fitted and plain. There is a big focus on the backs of dresses. Also belts are popular because they make a dress more individual. KA: Almond, which is a bit softer than ivory. ME: I love photographing veils. Are many people buying them? KA: Yes, especially single tier veils because they don’t hide the back of the dress. Either hip length or floor length. But with a full skirt you just want hip length. ME: When should a bride consider underwear? KA: Dresses come with cups, so actually no bra is the best way to make the dress fit properly. Also garters are only suitable for the full skirt, on a fitted skirt the garter will show through. ME: That’s great I hadn’t thought about that. What about shoes? KA: Brides need to have their shoes when they try their dress. A bit of a heel is great to improve posture. I suggest a completely smooth shoe, without buckles, so that the dress doesn’t catch. ME: Do you sell different coloured shoes? KA: All of our shoes are dyeable and we offer this service. ME: What about the bridesmaids? KA: Multiway dresses are really popular. These are the same dress that can be styled and worn in several different ways. Shades of blue have been the most popular colour going into 2017. I think that full length look better in photos. ME: Any other tips that you would give to brides? What about storage? KA: You can keep the dress in a canvas breathable storage bag in a cupboard and after the wedding use a specialist dry cleaners to remove stains and get the dress back to its original condition. If you’re planning to sell your dress afterwards, I suggest that you sell it immediately while it’s still in fashion – if you leave it too long it becomes less saleable. Many thanks to Kerri. If you’d like to visit Bridal Indulgence, please make an appointment either by phone or through her website. Please note the photograph of Kerri is not one of mine. Are you looking for more help or advice for your wedding? Please get in touch here.